Cholesteatoma is a skin cyst (or growth) in the middle ear. The problem can be from birth or acquired usually after recurring ear infections. 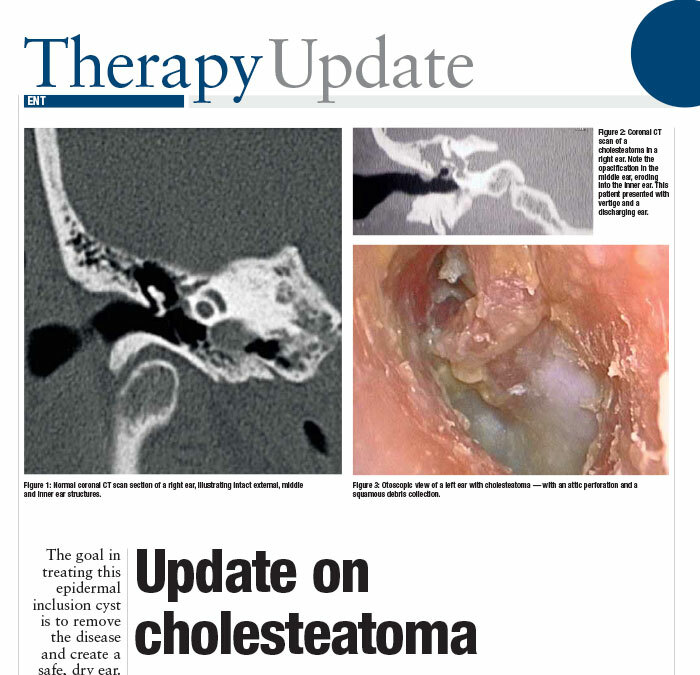 Cholesteatoma, if left untreated, can grow and destroy local important structures such as the bones of hearing, inner ear, facial nerve and rarely can inflame the brain lining or the brain itself and cause serious illness. The chief complaint is usually a blocked ear, hearing loss or recurrent infections. A CT Scan (computed tomography or Xray of the ear) confirms the disease. A hearing test sometimes shows a hearing loss, which is usually conductive in nature. Cholesteatoma is usually treated surgically to eliminate the infected bone and skin cyst and therefore prevent serious complications. Endoscopic (Keyhole) techniques are becoming more commonplace and can be used to treat even larger cholesteatoma. Modern day cholesteatoma surgery is either performed as a day surgery or overnight stay in hospital. Three broad techniques are used – Endoscopic (Key Hole), Canal Wall Up and Canal Wall Down Surgery. One of these three techniques is used depending on the aggressiveness of the cholesteatoma. Endoscopic is the least invasive (with no external cuts), Canal Wall Up preserves the bony ear canal (but involves a cut behind the ear) and Canal Wall Down removes the bony ear canal and most of the mastoid bone (in this technique there is a large cut behind and in the ear canal; leaving the patient with a very large ear hole and a flattened ear). More information can be found on the hillsent.com.au website. This is the newest technique which requires specialised equipment and is often the most technically challenging. 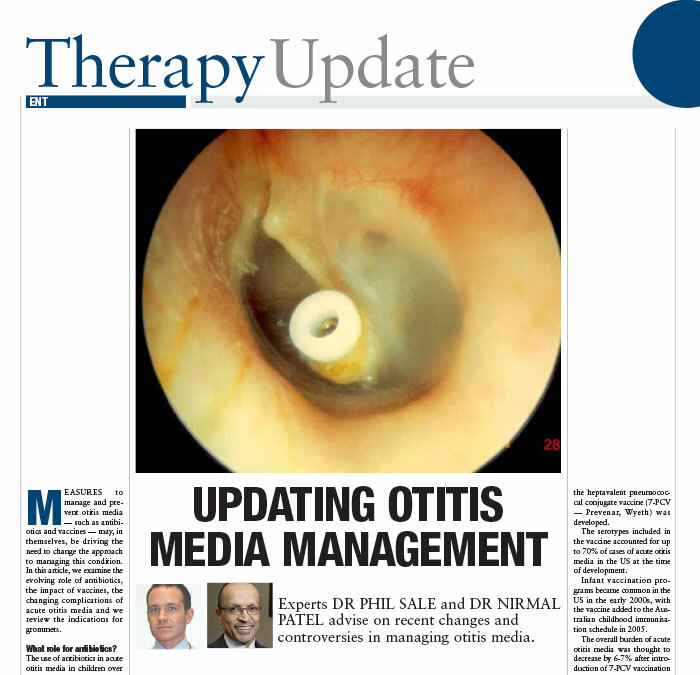 The endoscopic method is the technique of choice by Dr Nirmal Patel if the cholesteatoma is localised to the middle ear (including the roof of the middle ear). The keyhole technique has the advantage of requiring no cuts outside the ear canal and no hair shaving. This newer option is usually a day surgery procedure. The recovery is in general less painful and quicker than canal wall up or down techniques. The patient usually returns to normal activities a lot quicker. The is often more technically difficult than canal wall down, but may have the benefit of preserving near normal bony anatomy and position of the ear drum in the ear. If the cholesteatoma extends into the mastoid bone then this is Dr Nirmal Patel’s preferred technique. Canal Wall Up surgery allows the patient to ultimately treat the affected ear relatively normally (i.e. allow water exposure and swim normally). The disadvantage is sometimes this technique requires two operations; the first to remove the disease and the second to reconstruct the hearing. At the first operation, the plastic sheet will be inserted to allow normal healing without scar tissue formation. In the next operation, the plastic sheet is removed and prosthetic ear bones will be placed to attempt to restore hearing. It won’t be known until the time of the first surgery whether it will be necessary to separate the two stages of the operation. These are used when the disease is severe and has already damaged the ear canal wall, inner ear, brain lining or facial nerve. They are not the technique of choice in our clinic as the technique is more deforming causing a wider opening of the ear canal and more bone removal (which ultimately means the ear sits more recessed and flatter on the skull; the healing is also prolonged compared to canal wall up techniques. Also in our hands, the Wall Down technique means a worse hearing outcome (compared to transcanal or canal wall up) with hearing bone reconstruction, as the middle ear space is usually shallower. After canal wall down mastoidectomy it is necessary to have the cavity cleaned every 6 to 12 months, and some patients will need to permanently avoid getting water in their ear.